I can’t remember when I first heard of the Winchester Mystery House – it had to be about ten years or so, but I never really researched the house or the woman: both which are shrouded in mystery. I mean, I don’t live in California (and when I did I lived in Los Angeles, a way’s away from San Jose, and I lacked a car) and while I was always intrigued by the story, or what I knew of it, I filed it away in my ‘Must See When I Visit’ file and didn’t think much of it. 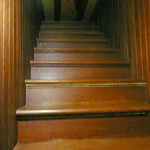 People who love to think about ghosts, haunting and superstitions are convinced this is the reason the Winchester house is so crazy, while skeptics insist Sarah Winchester was simply a widow struggling with depression and looking for a way to keep busy. Personally, I think Sarah Winchester believed the psychic more or less, but was looking for something to occupy her time anyway (because she was depressed). I know when I am in a funk there is nothing to help me snap out of it like some sort of project. She moved to California and began work on the mansion that still stands today. Construction lasted for 38 years, around the clock, 24/7 until Sarah actually did die from natural causes at the tender age of 84 or 85 (her exact birth date is not known, but she died the same month she was born so there you go). The house is full of stairways and doors that lead nowhere, bathrooms that aren’t… indoor windows, a secret room (for the believers, it is said this is where she tried to contact her husband from beyond the grave) and so much more. 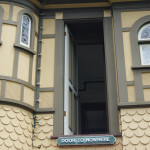 Even skeptics can’t discount that Sarah Winchester wasn’t superstitious since the number thirteen can be found in too many places to count inside the house (thirteen steps, windows, etc.) or the fact that after the house caught fire (due to an earthquake) Sarah Winchester suddenly stopped construction on the part of her house that was almost finished (she felt it was the spirits telling her she was too focused on that one part of the house). Window Built Into the Floor! I have to admit I am a total house geek. I know nothing about architecture, but love checking out houses of all sorts as well as beautiful and old buildings. (I have been known to attend a few open houses just to ‘get ideas’ in my day. Okay, I still totally do it.) To be honest, it was the house that lured me more than some story rooted in superstition (but it doesn’t hurt that I love history, the stranger the better). The tours (one for the house, another for the grounds, other buildings and basement) were awesome. I think this tourist spot was my favorite of the entire trip (in terms of tourist spots, Alcatraz was a close second). The house was beautiful, the interiors, furnishings and Sarah Winchester’s ‘storage’ took my breath away, but the absurdity of so much of the house made me often wonder if I should laugh, ‘ooo and aww’ or shake my head at the crazy. And that was exactly why I wanted to go in the first place! A beautiful house is special, a bizarre house is memorable, but when the two come together? That is a story, and not just one story, but several. 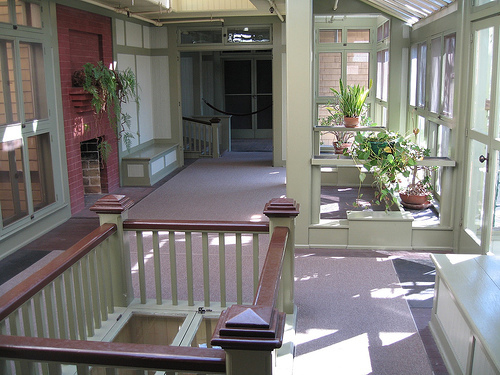 When you walk the halls of the Winchester Mystery House or explore the gardens, that is what overtakes you. At least it did for me. I felt the stories of the house as I explored those halls. I felt the story of the house, the woman who built it and all of the other stories somehow connected to the place. If you’re ever in San Jose, you must visit. Take in the beauty, wonder at the bizarre and keep yourself and your senses open. Feel the stories, because wow, what stories they are! This entry was posted in Entertainment, History, People, Personal, travel and tagged "historical site", "Sarah Winchester", "Winchester Rifle", “San Jose”, “Winchester Mystery House”, architecture, curse, haunted, mansion, mystery, psychic. Bookmark the permalink. We visit San Jose often enough and have passed the house but never knew what it was all about. Thanks for solving the mystery – and next time we will visit!